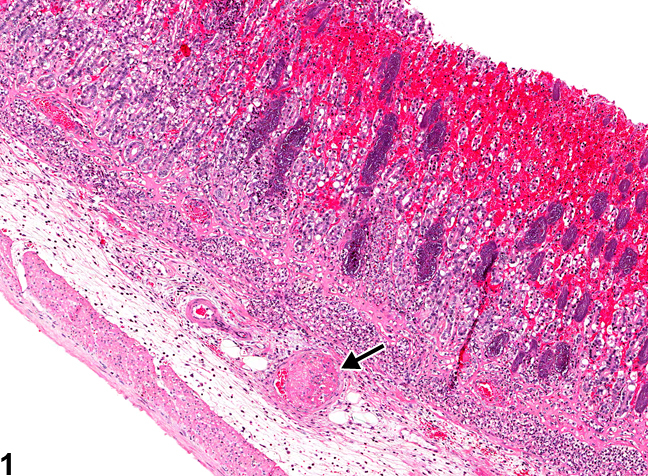 Stomach, Glandular stomach - Thrombus in a male F344/N rat from a chronic study. 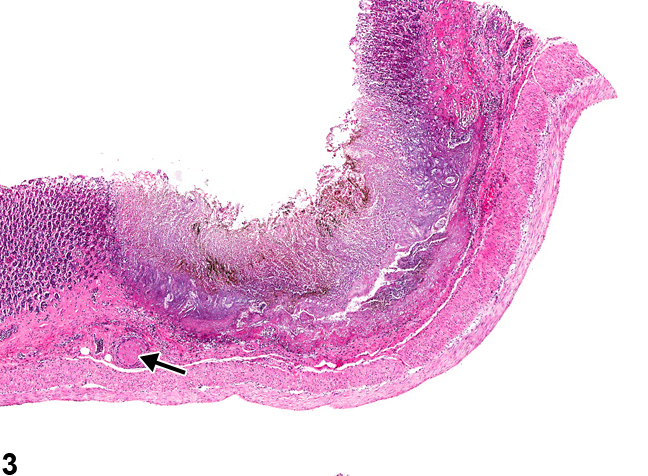 The thrombus in the submucosa (arrow) resulted in mucosal necrosis. 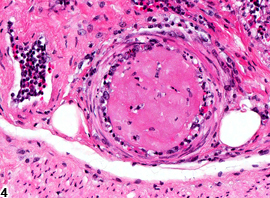 Stomach, Glandular stomach - Thrombus in a male F344/N rat from a chronic study (higher magnification of Figure 1). The thrombus occludes a submucosal blood vessel. 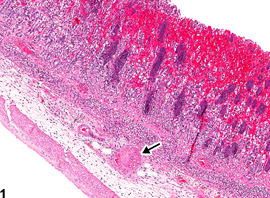 Thrombosis in vessels ( Figure 2 and Figure 4 ) supplying the stomach wall can result in hemorrhage and necrosis ( Figure 1 and Figure 3 ). Thrombosis may originate in the vessel wall or may be the result of thromboemboli originating elsewhere, such as the atrium or valves. Whenever present, thrombi should be diagnosed and graded. The severity grade for thrombi depends on the number of vessels thrombosed and the size of the thrombi. 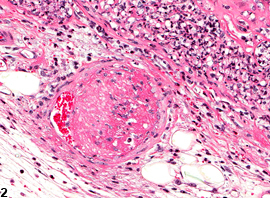 Small thrombi found in vessels in areas of inflammation and necrosis are not usually recorded if they appear to have formed as result of the local inflammatory process. 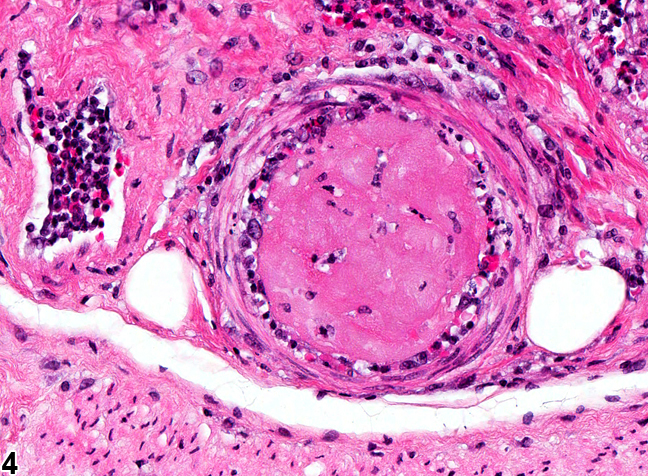 Hemorrhage in an area of necrosis secondary to a thrombus is not usually recorded unless it is a prominent lesion. If a thrombus results in necrosis (infarction) of the tissue, both the thrombus and the necrosis are recorded and graded. MacKenzie WF, Alison R. 1990. Heart. In: Pathology of the Fischer Rat (Boorman GA, Montgomery CA, MacKenzie WF, eds). Academic Press, San Diego, CA, 461-472.